What are American politics coming to? I just watched a joint interview with Ralph Nader and Congressman Ron Paul — and they were mostly on the same side! Nader has spent his life promoting government intervention in the economy. Paul has spent his life promoting the free market and minimal government. For the two of them to discuss making common cause is something extraordinary. And yet it makes total sense. What’s so exciting is that their common cause shines the spotlight right where it’s needed: on corporatism — the constellation of government policies that primarily benefit wealthy and well-connected business and banking interests at the expense of the rest of us. While much of the right wing sees the danger of the Obama administration in Marxism and state socialism, Paul and Nader realize that that makes no sense. Bill Daley, Tim Geithner, Larry Summers, Paul Volcker and Jeff Immelt are not the men a Marxist would pick as advisers. But they are the picks of a president who believes that economic stability can exist only if government and major businesses manage the economy together. Corporatism is the opposite of free markets, competition and full individual liberty. Paul and Nader are also united in their opposition to America’s imperialist policies and perpetual overt and covert wars, which, in truth, are also part of the corporate state. Foreign wars and world policing may not be solely motivated by economic interests, but they play a big role. Writer Nick Turse documents that the military-industrial complex is more pervasive than ever. The defense budget is a gigantic trough at which American companies can feast at taxpayer expense. Why take risks on new and better products for consumers, when the government will pay top tax dollar to pay for you make bombs, rockets and Humvees? Along with the imperial state comes domestic surveillance and other destruction of civil liberties — all of which Paul and Nader despise. The horrendous Patriot Act is a prime target for both men. Paul and Nader have many differences, of course, especially relating to welfare-state and regulatory programs. But they agree that spending hundreds of billions of dollars on military adventures, bailouts and other forms of subsidies is contrary to the interest of most Americans. 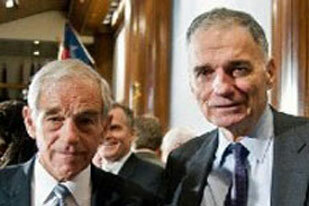 Paul and Nader also don’t like the Federal Reserve, America’s central bank. While they have different ultimate wishes for the Fed — Paul would abolish it; Nader would make it an “accountable” cabinet department — both object to its having the autocratic power to bail out banks and other corporate interests. Moreover, both understand that fighting imperial wars would be impossible if the government couldn’t manipulate the currency through the Fed. Besides the killing abroad and regimentation at home, we also get a destruction of our purchasing power through inflation. That Paul and Naer understand all this and are talking about it in joint appearances is exciting. Who knows where it could go from here? Yes, progressives and libertarians have serious differences, just as they both have with conservatives. But all people of good faith who oppose America’s corporate welfare-warfare state — whether progressives, conservatives or libertarians — have an interest in moving America in a different direction.